Jungle Friends residents Timmy and Dylan began their lives in the usual monkey way. Immediately after birth they snuggled into their mothers' warm furry monkey breasts. Monkey love formed an immediate, instinctive mother and child bond. Then their world fell apart. After just a few days, human hands pried tiny fingers from mothers' fur and arranged the babies on cold stuffed animals - where they clung because they had no choice. A human family felt entitled to raise these wild animal babies in an unnatural habitat with unnatural habits. Timmy and Dylan's monkey mothers would have nursed and held them constantly. The humans gave them bottles, cuddling them when they weren't busy with human things. Their monkey moms would have gradually encouraged them to explore, to leap shrieking through high branches and poop at will. The humans punished them for exploring in the "wrong" places and even more for shrieking and pooping. The humans got all kinds of attention and admiration from other humans for the childlike pets they kept in a cage, and congratulated themselves. Fortunately, Timmy and Dylan didn't have to put up with that life for more than a few weeks. The humans were breaking state law and had to give them up. 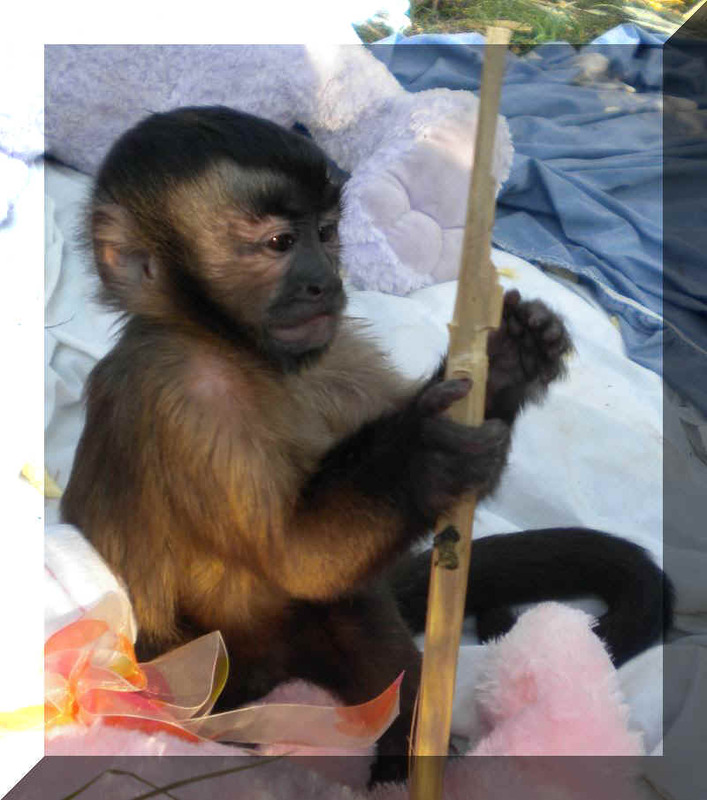 The baby monkeys wound up at a zoo, and the zookeepers called Jungle Friends to find them a forever home. 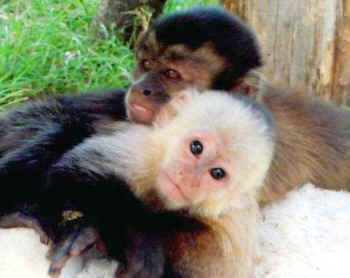 Now these two young capuchins get to live their lives in a semblance of the usual monkey way. Together in as natural a habitat as possible, with plenty of food and things to climb, Timmy and Dylan live safe from predators and disease. They joyfully ride on other monkeys' backs, splash in a little pool, poop where they please, shriek and screech and dig little treasures out of the grass. Their individual personalities shine brightly. But look deeper. 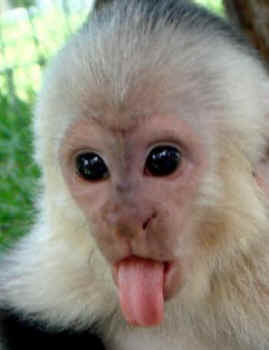 While Timmy and Dylan enjoy all the advantages of well-kept sanctuary monkeys, their early trauma shows. They rock back and forth sucking their thumbs, clinging to stuffed animals as if expecting the polyester fluff to come to life. If they go the way of other monkeys who started life without a monkey mom, they may spend 40 years craving stuffed animals as surrogate mothers. In the wild, young monkeys cling to mom for months and stick close for years. But in captivity the longings that stem from early, motherless misery never really end. And what about Timmy and Dylan's mothers? Still held captive by breeders, these moms are left alone with their monkey thoughts and empty breasts, bearing more babies to fill humans' selfish needs for affection and attention, grieving new losses year after year. What kind of life is that for a mother?